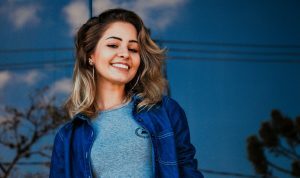 Home › Aesthetic dentistry › What Are Micro-Thin Veneers in Nashville and How Can They Help You? Do you have imperfections in your smile that make you self-conscious? If so, then ask our office about Micro-thin veneers. This cosmetic dental procedure could repair damage to your smile in just a few visits. At Nashville Center for Aesthetic Dentistry – Dennis J. Wells, DDS, our dental team works together in order to provide patients with a smile they can look forward to. Micro-thin veneers in Nashville are a revolutionary approach to improving cracked and chipped teeth. Veneers are thin white shells that are designed to cover up imperfections in your smile. Unlike regular dental veneers, micro-thin veneers don’t require the removal of healthy tooth enamel in order to restore your teeth. The material used is bonded directly to the teeth to improve their appearance. Along with repairing damage, veneers can also increase the size of your teeth or make your teeth appear straight. Micro-thin veneers in Nashville are a fantastic cosmetic solution for those who aren’t confident in their smile. Patients who have elected for this procedure have noticed vast improvements in their every day life. Not only are they more confident, but they also find themselves smiling more in pictures and with friends. Talk to our team to determine if this cosmetic dental procedure is right for your smile. At the Nashville Center for Aesthetic Dentistry – Dennis J. Wells, DDS, we focus on providing our patients with high-quality dental veneers in Nashville. For more information about cosmetic dental treatments, give us a call 615-371-8878. We can provide you with details about services such as dental implants, porcelain crowns, and restorative dentistry. Our friendly staff is eager to help you smile shine. Start your New Year the right way! ‹ Start the New Year with Implant Dentures in Nashville!